1 LP Duality Lecture 13: Feb 28. 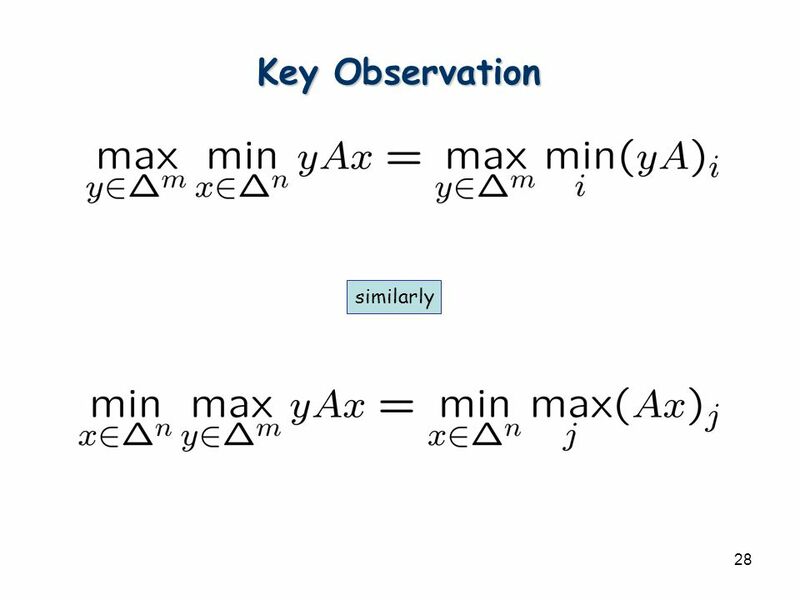 2 Min-Max Theorems In bipartite graph, Maximum matching = Minimum Vertex Cover In every graph, Maximum Flow = Minimum. 2 2 Min-Max Theorems In bipartite graph, Maximum matching = Minimum Vertex Cover In every graph, Maximum Flow = Minimum Cut Both these relations can be derived from the combinatorial algorithms. 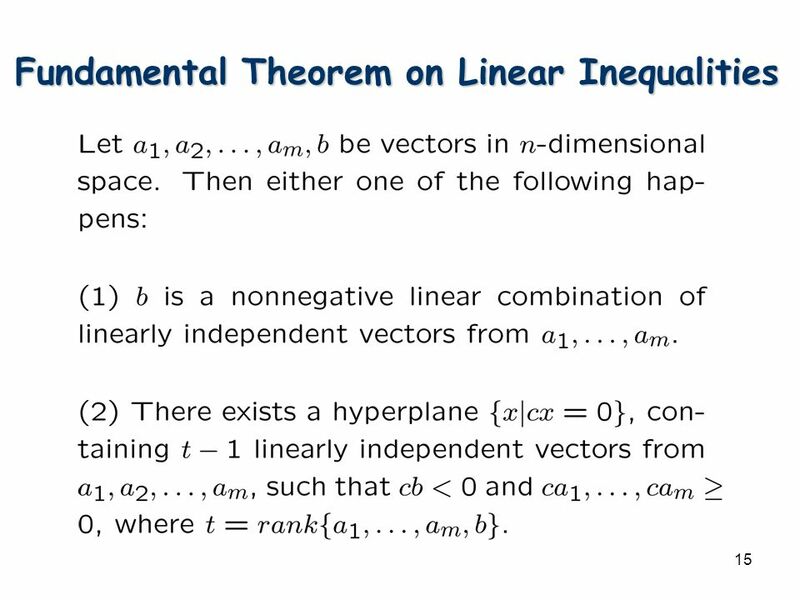 We’ve also seen how to solve these problems by linear programming. 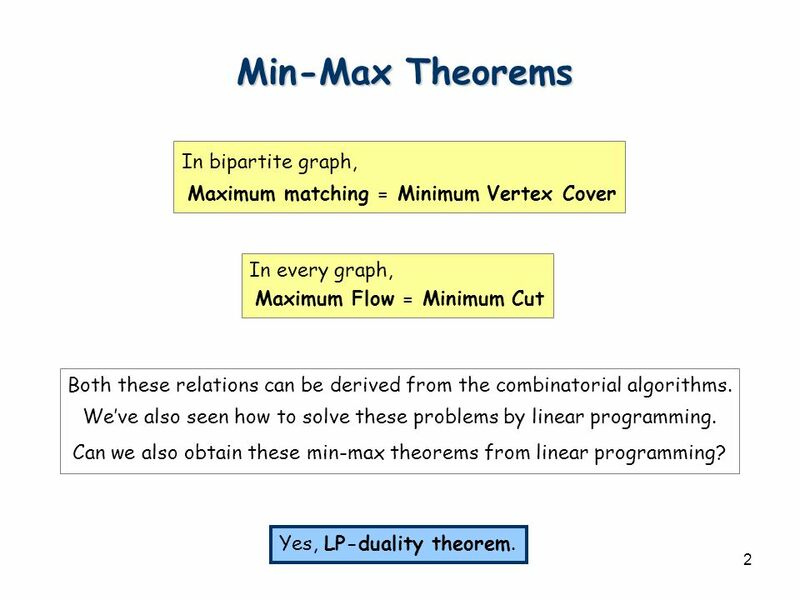 Can we also obtain these min-max theorems from linear programming? 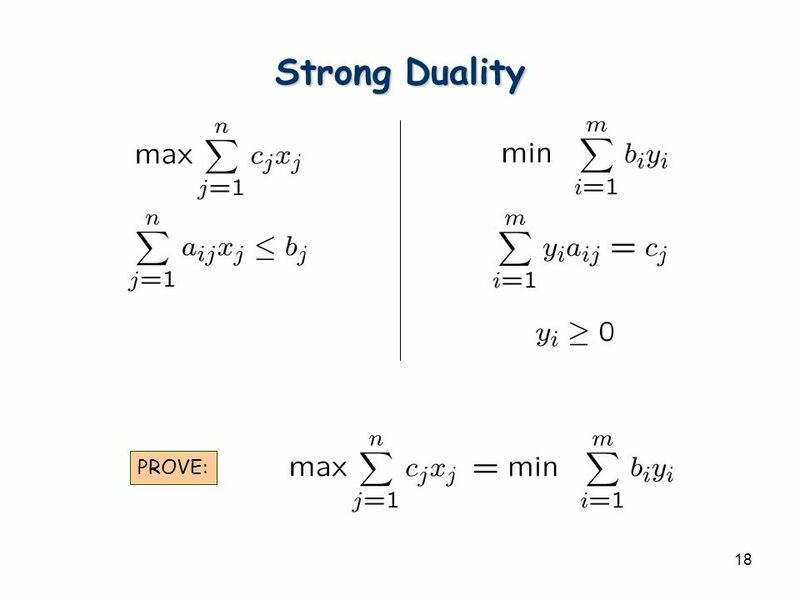 Yes, LP-duality theorem. 4 4 NP and co-NP? 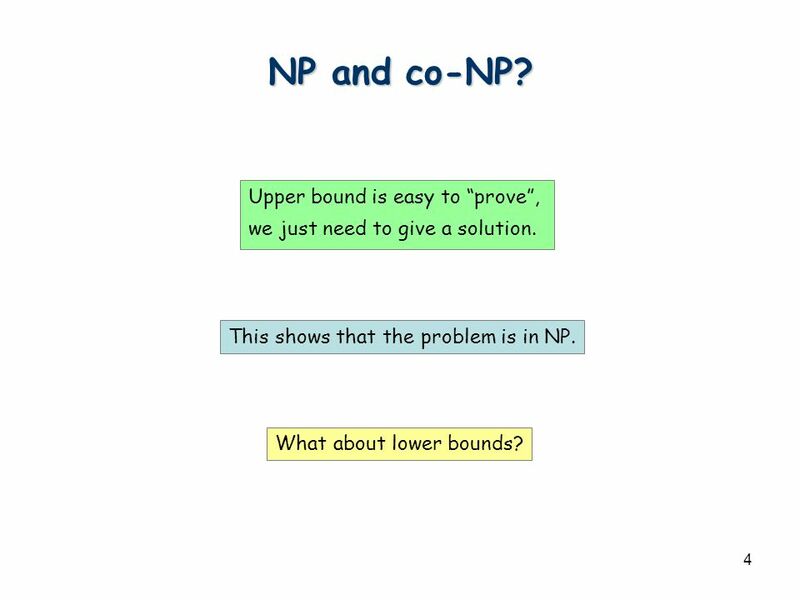 Upper bound is easy to “prove”, we just need to give a solution. What about lower bounds? This shows that the problem is in NP. 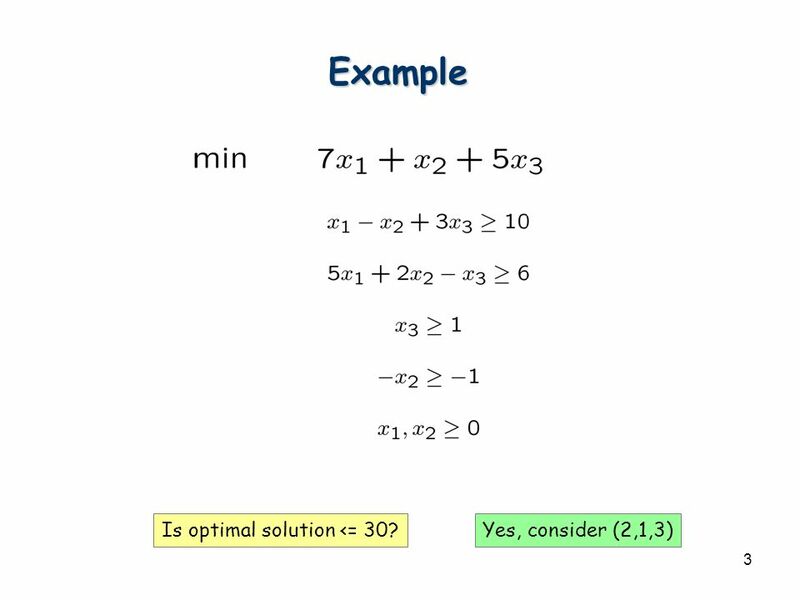 5 5 Example Is optimal solution >= 5? Yes, because x3 >= 1. 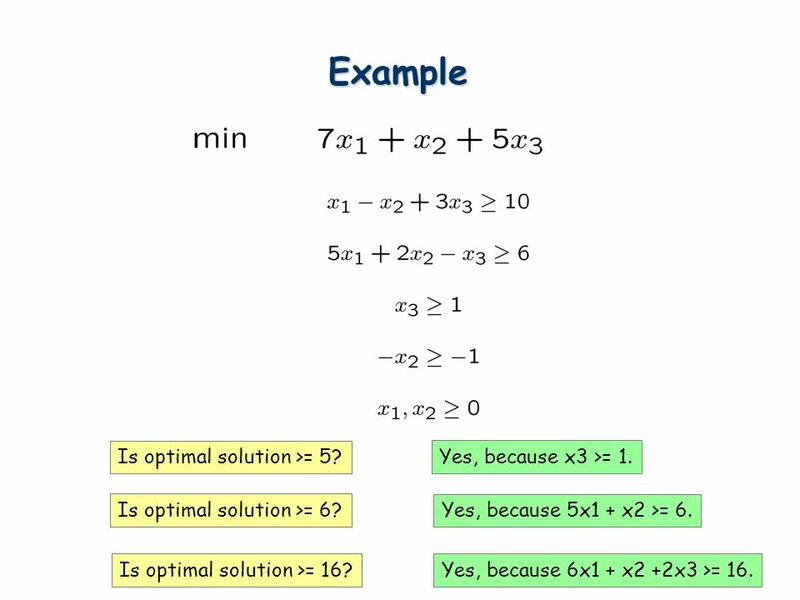 Is optimal solution >= 6? Yes, because 5x1 + x2 >= 6. 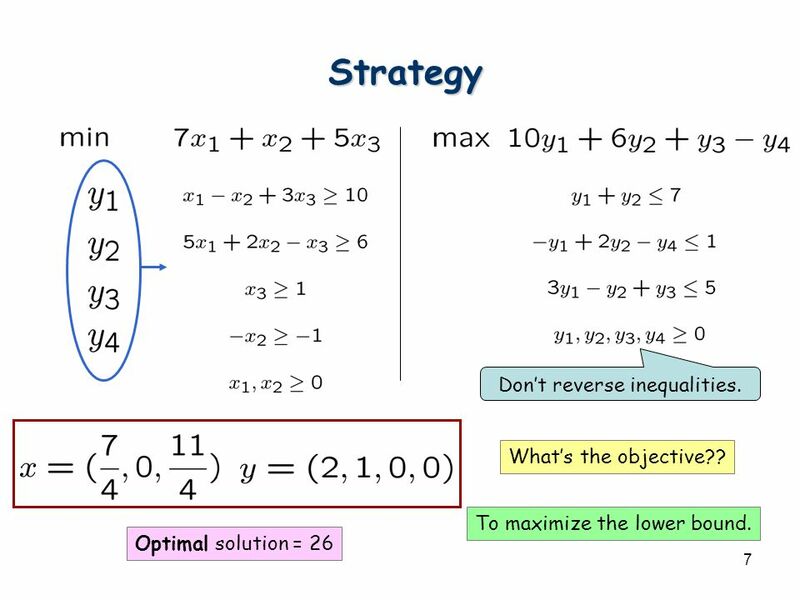 Is optimal solution >= 16?Yes, because 6x1 + x2 +2x3 >= 16. 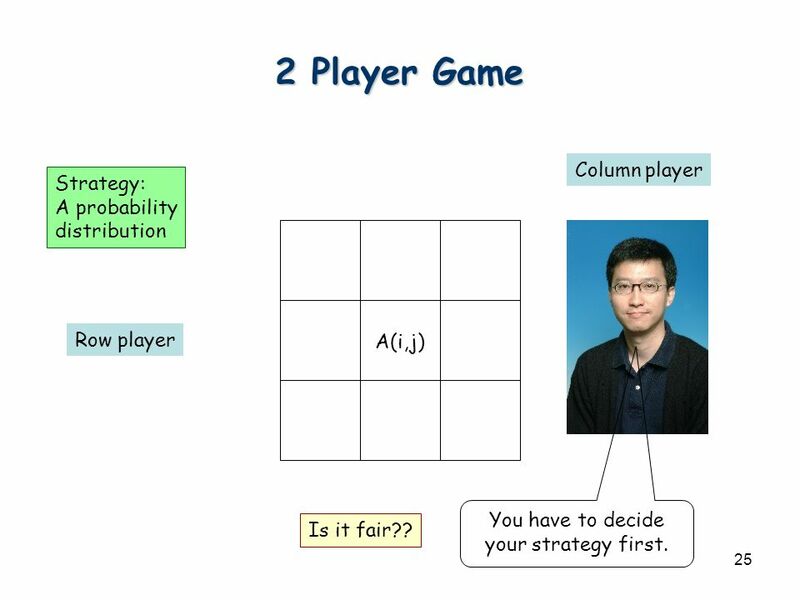 6 6 Strategy What is the strategy we used to prove lower bounds? 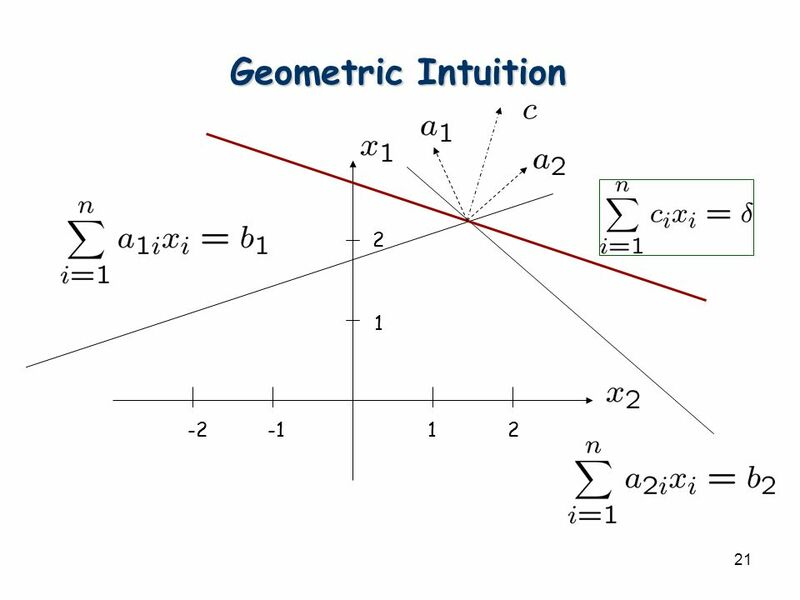 Take a linear combination of constraints! 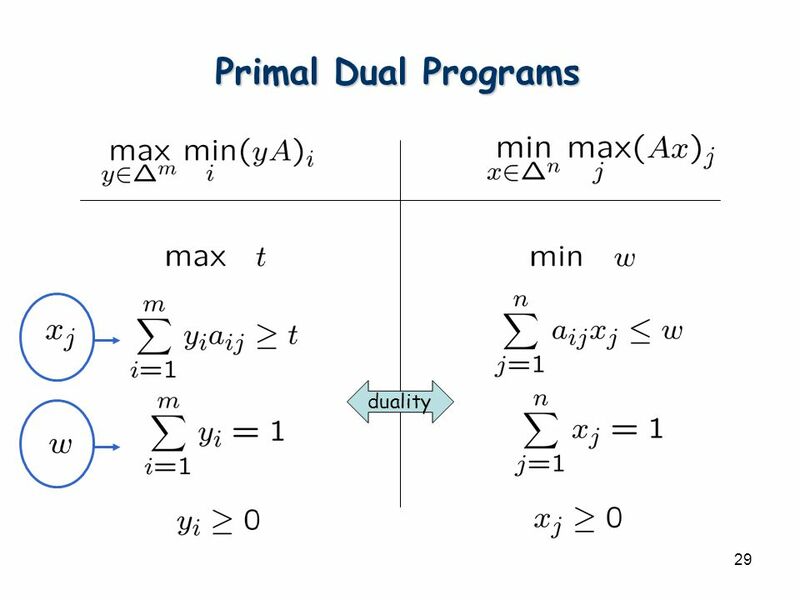 10 10 Maximum bipartite matching To obtain best upper bound. 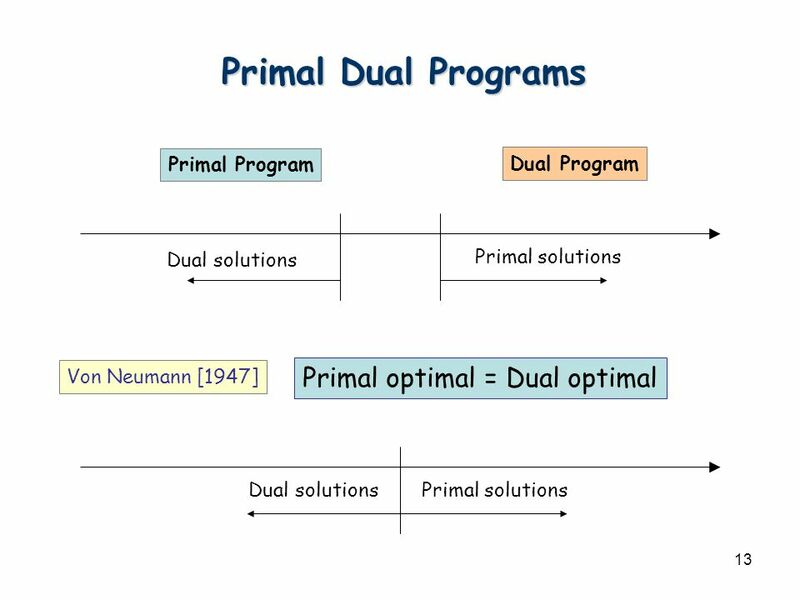 What does the dual program means? Fractional vertex cover! 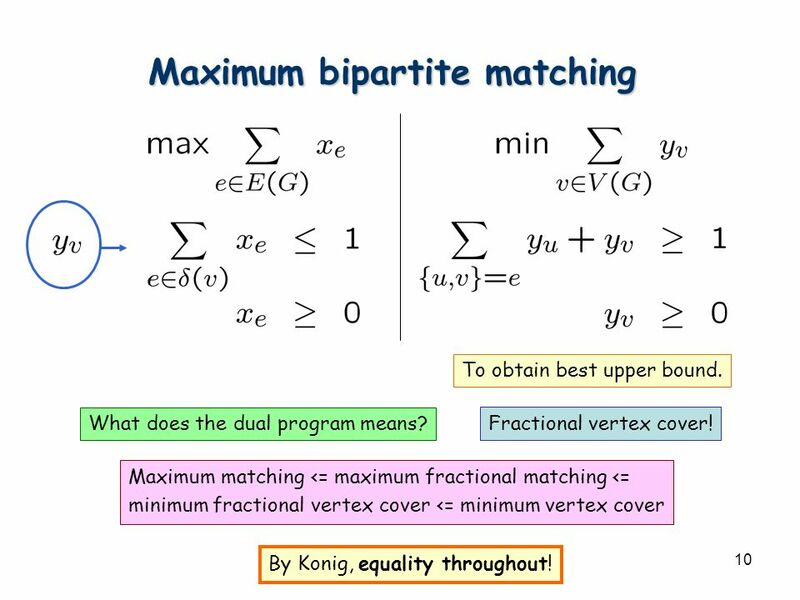 Maximum matching <= maximum fractional matching <= minimum fractional vertex cover <= minimum vertex cover By Konig, equality throughout! 11 11 Maximum Flow s t What does the dual means? pv = 1 pv = 0 d(i,j)=1 Minimum cut is a feasible solution. 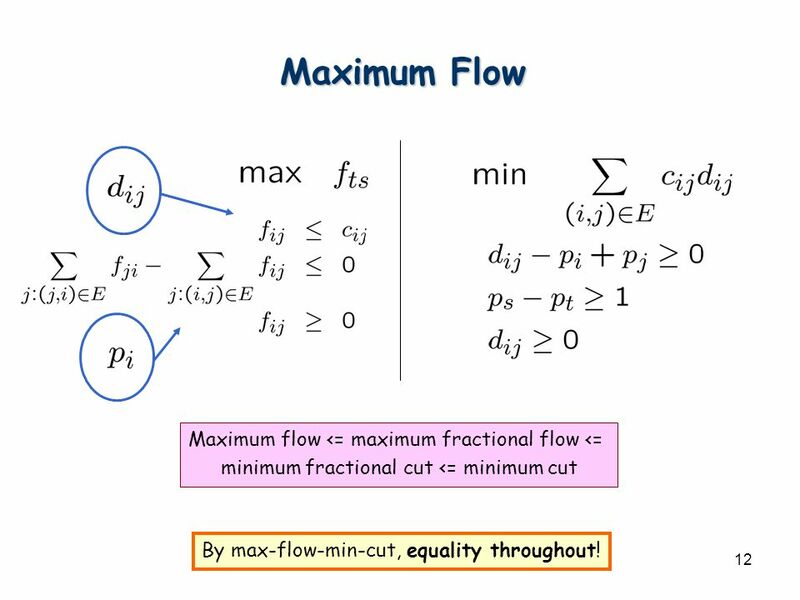 12 12 Maximum Flow Maximum flow <= maximum fractional flow <= minimum fractional cut <= minimum cut By max-flow-min-cut, equality throughout! 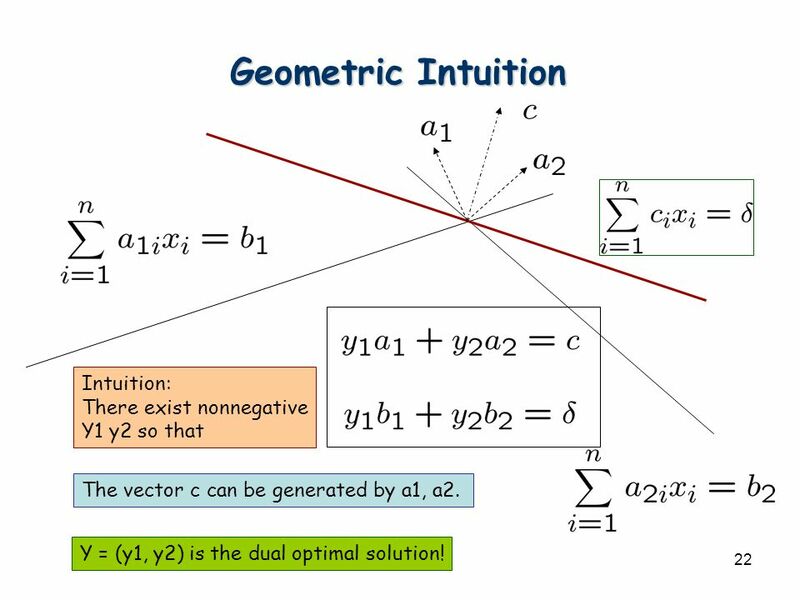 22 22 Geometric Intuition Intuition: There exist nonnegative Y1 y2 so that The vector c can be generated by a1, a2. 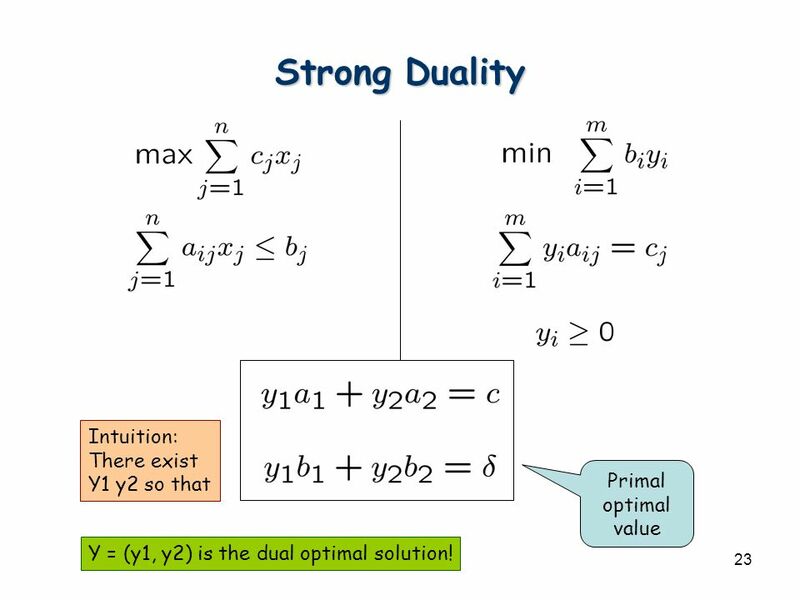 Y = (y1, y2) is the dual optimal solution! 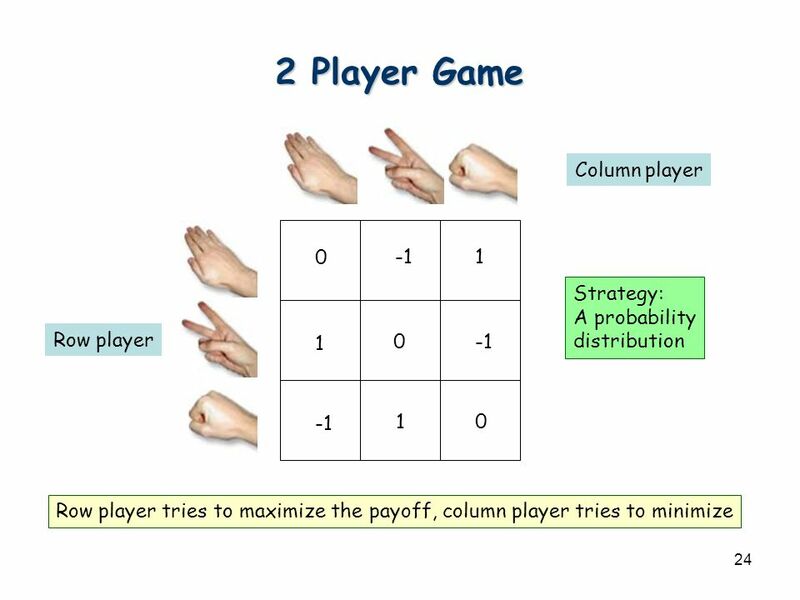 25 25 2 Player Game A(i,j) Row player Column player Strategy: A probability distribution You have to decide your strategy first. Is it fair?? 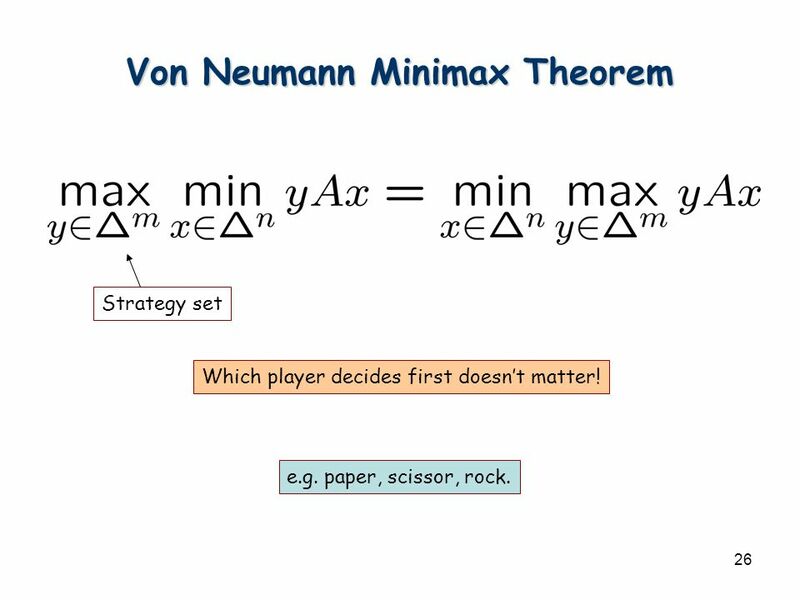 26 26 Von Neumann Minimax Theorem Strategy set Which player decides first doesn’t matter! e.g. paper, scissor, rock. 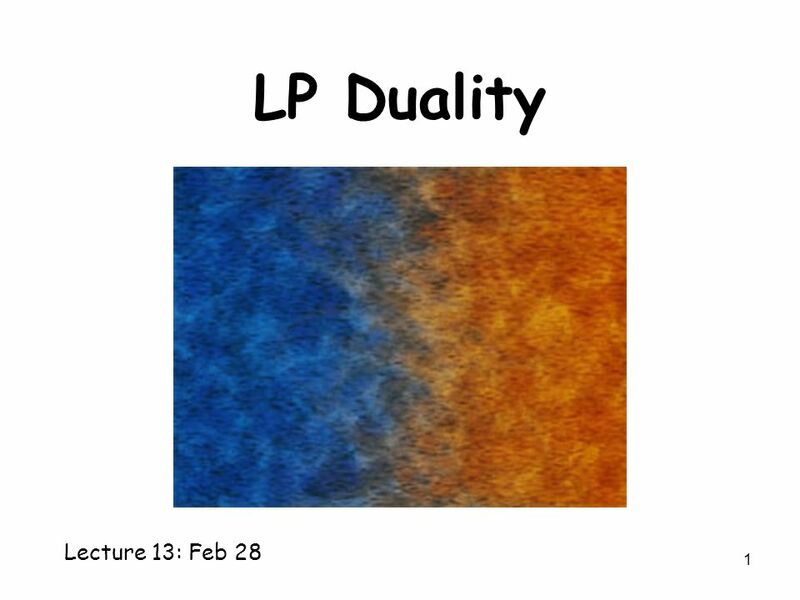 Download ppt "1 LP Duality Lecture 13: Feb 28. 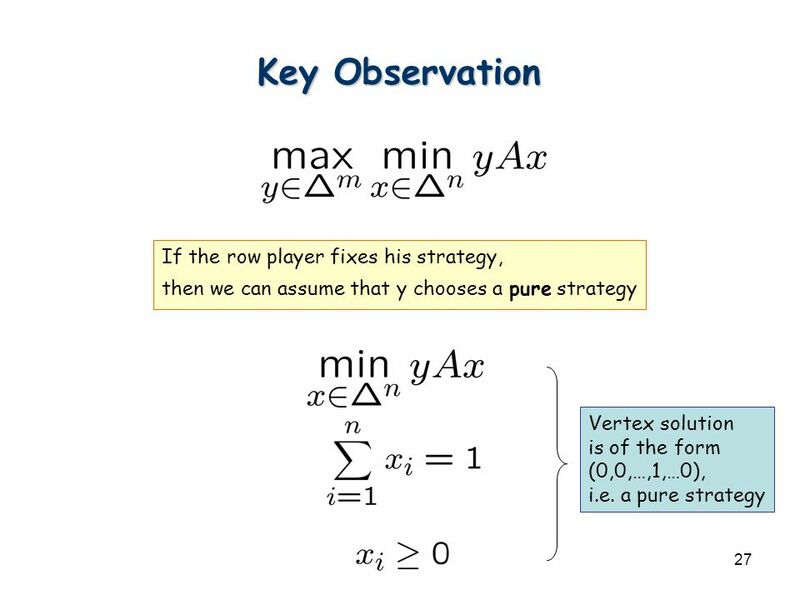 2 Min-Max Theorems In bipartite graph, Maximum matching = Minimum Vertex Cover In every graph, Maximum Flow = Minimum." 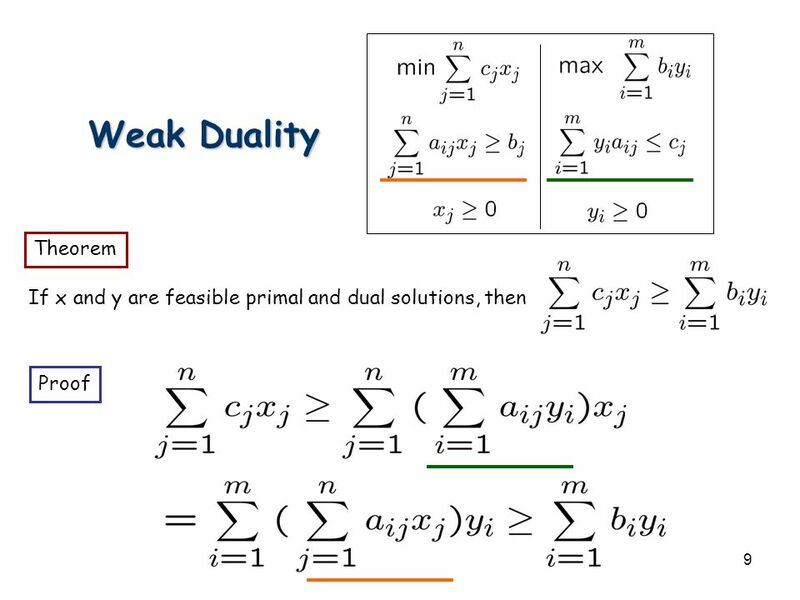 Tuesday, March 5 Duality – The art of obtaining bounds – weak and strong duality Handouts: Lecture Notes. 1 LP, extended maxflow, TRW OR: How to understand Vladimirs most recent work Ramin Zabih Cornell University. 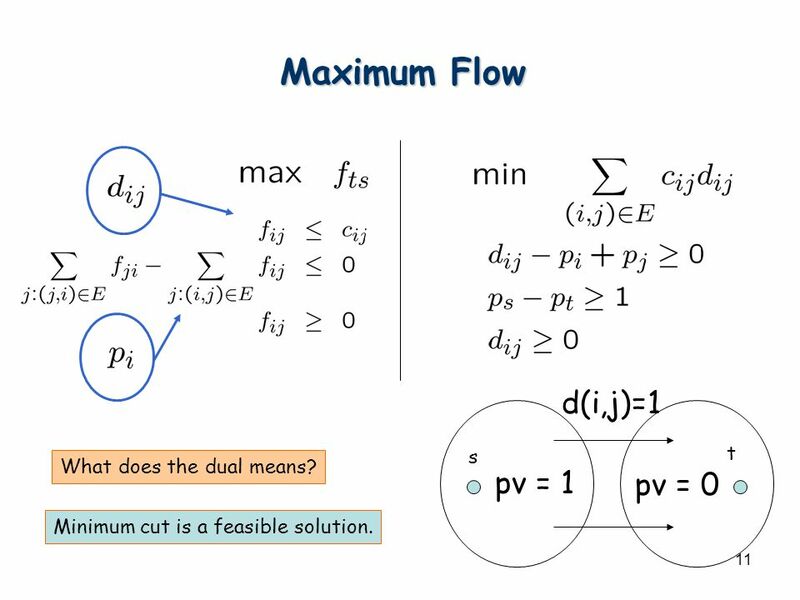 Maximum Flow and Minimum Cut Problems In this handout: Duality theory Upper bounds for maximum flow value Minimum Cut Problem Relationship between Maximum. Algorithm Design Methods Spring 2007 CSE, POSTECH. Primal Dual Combinatorial Algorithms Qihui Zhu May 11, 2009. C&O 355 Lecture 8 N. Harvey TexPoint fonts used in EMF. Read the TexPoint manual before you delete this box. : A A.
C&O 355 Lecture 9 N. Harvey TexPoint fonts used in EMF. C&O 355 Lecture 23 N. Harvey TexPoint fonts used in EMF. Read the TexPoint manual before you delete this box. : A A A A A A A A A A.
ECE Longest Path dual 1 ECE 665 Spring 2005 ECE 665 Spring 2005 Computer Algorithms with Applications to VLSI CAD Linear Programming Duality – Longest. 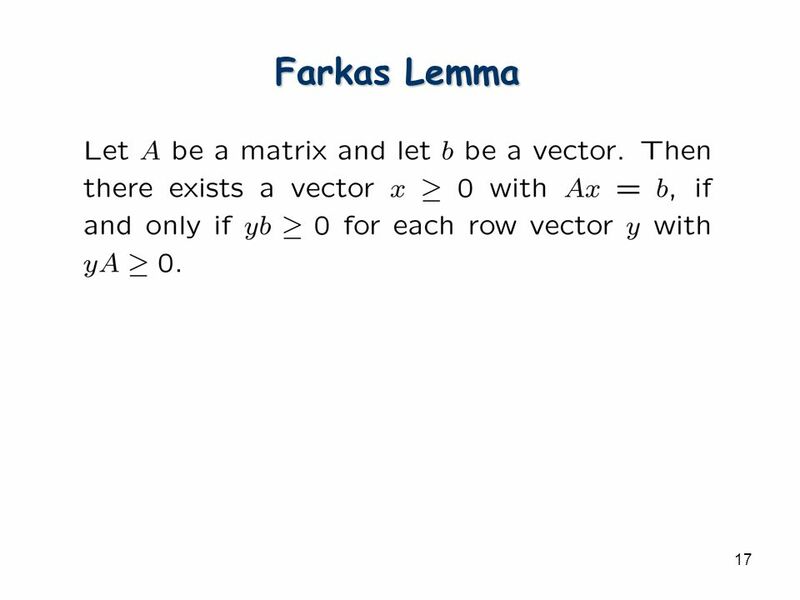 C&O 355 Mathematical Programming Fall 2010 Lecture 22 N. Harvey TexPoint fonts used in EMF. Read the TexPoint manual before you delete this box. 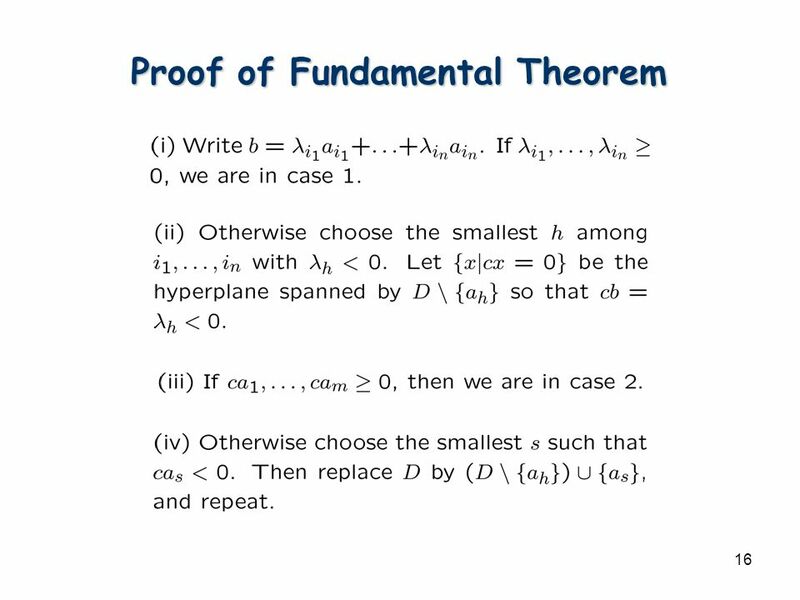 : A A A.
UMass Lowell Computer Science Analysis of Algorithms Prof. Karen Daniels Fall, 2002 Lecture 8 Tuesday, 11/19/02 Linear Programming. 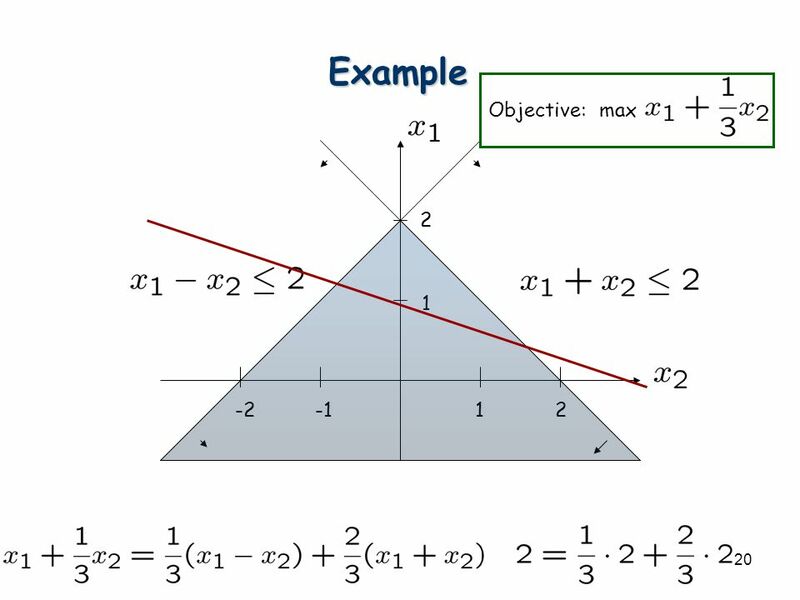 Linear Programming Unit 2, Lesson 4 10/13. Instructor Neelima Gupta Table of Contents Lp –rounding Dual Fitting LP-Duality. CSCI 3160 Design and Analysis of Algorithms Tutorial 6 Fei Chen. UMass Lowell Computer Science Analysis of Algorithms Prof. Karen Daniels Fall, 2006 Lecture 9 Wednesday, 11/15/06 Linear Programming. 3.4 Linear Programming p. 163. 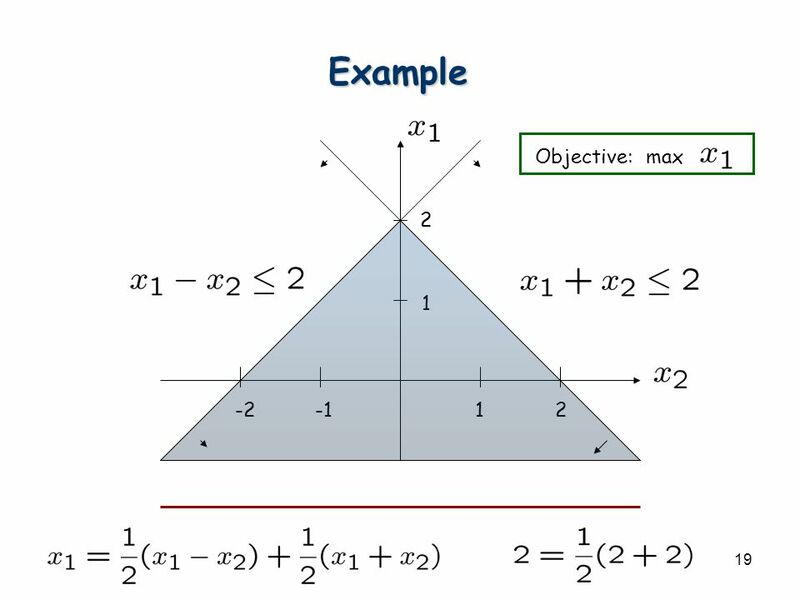 Optimization - Finding the minimum or maximum value of some quantity. 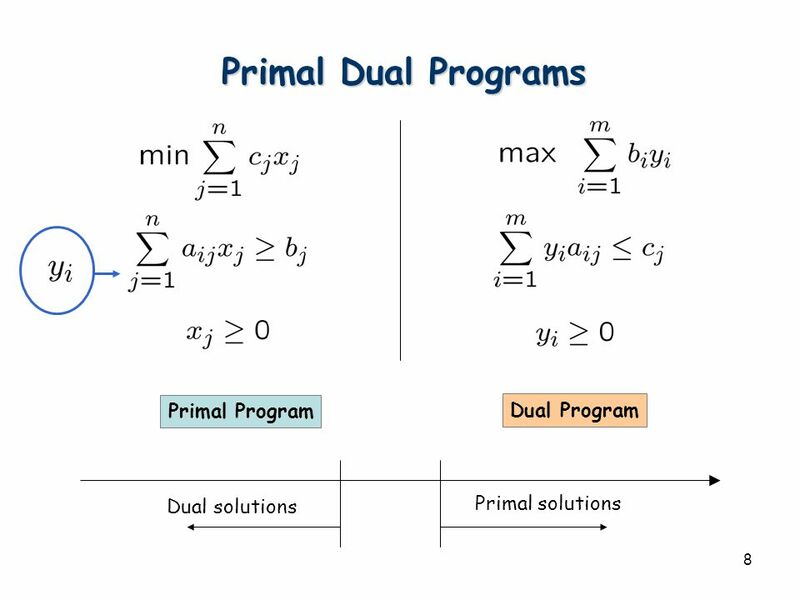 Linear programming is a form of optimization where.